Ancient Rome continues to fascinate a wide audience, mixing political and strategic lessons with a bloody soap opera. Nowhere is this more apparent than Rome’s succession of emperors, who offer a timeless example of political cunning, public excess, and complex personalities. 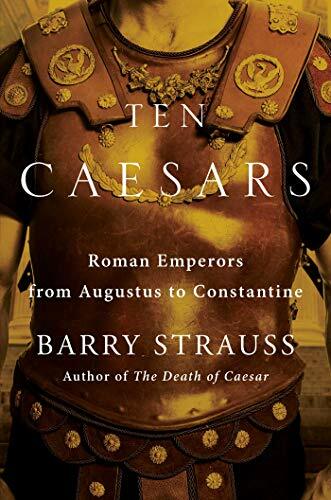 Professor Barry Strauss, who has published numerous works on Roman and Greek military history, has chosen ten of Rome’s most notable Emperors to profile in this new book, offering both an educational and titillating look at these men in this highly readable work. When selecting a snapshot of Rome’s many rulers, arguments will arise about why some were chosen and others left behind. The expected choices are here; Caesar Augustus, Nero, Constantine, and Marcus Aurelius, familiar figures to any student of ancient Rome. But some other choices may not be as well known to a general audience: Vespasian the Commoner, Septimius Severus the African, and Trajan the Best Prince, as Strauss labels these lesser known emperors. While he chose ten men to focus on, Professor Strauss provides excellent narrative continuity of the entire Roman Empire, particularly when decades occur between his chosen subjects. A couple of remarkable themes emerge in this book that make it an even more fascinating and relevant read. First, each of these men was a complex mix of cruelty and generosity, intrigue and wisdom, and ego combined with virtue. Above all, their lives and actions confirm the truth that not much changes concerning human nature regardless of supposed civilizational or technological advancement. Each of the emperors considered execution or exile of their foes the natural way of politics, yet most of them also showed at least a token of concern for the common people, to the extent they felt they needed their support. As the author emphasizes, the Roman army really became the foundation of the empire, and many of these emperors were career soldiers who used the loyalty of their troops to gain and keep their thrones. Any student of political science can learn a number of lessons from this book, mostly Machiavellian ones, on how to acquire and maintain power while satisfying multiple competing constituencies. More thought-provoking to modern readers will be learning about the outsized influence of women on Roman politics and the succession of emperors to the throne. The author describes in great detail the equally earnest intrigues of mothers and wives to place their sons or husbands in positions of power. Once they have succeeded, many of these women wielded enormous influence and wealth, with several of them, notably Livia, wife of Caesar Augustus, and Domina, wife of Septimius Severus, becoming virtually co-emperors with their husbands and acquiring royal titles and their own property. The other influence the author touches on is the rise and spread of Christianity throughout the empire. Each of the rulers profiled had their own interactions with this competing religion to the traditional Roman gods, mostly benign neglect or indifference. However, several emperors, particularly Nero and Diocletian, launched heavy handed persecutions that had the unintended consequence of strengthening the spread and depth of Christianity as even senators and centurions converted over time. When Constantine comes to power under the symbol of Christ and legitimizes this faith, the stage is set for a new set of issues, as the author details Constantine’s entry into the theological disputes of the early Christian church, to the point of convening one of the most important councils in church history, the Council of Nicaea. As the author winds down the book with a post-script describing the final days of the divided Roman Empire, with Constantine shifting the center of power from Rome to his new city of Constantinople, the reader is left with a much better sense of how this fairly small and impoverished city was able to rise and rule the Mediterranean basin for over 1000 years. Each of these men played their part and their stories are fascinating case studies of politics, family drama, and ultimately, leadership, both good and bad.